There are lots of ways to celebrate Halloween, from choosing jack-o'-lanterns and costumes to eating soup from a pumpkin. I did all of this on my recent trip to Oregon, plus a few extras, like wandering through dried corn plants in a twisty maze and disappearing in another maze of towering sunflower plants. It was my luck to be there for a harvest festival at Pheasant Fields Farm outside Medford. The afternoon was sunny and warm (I thought it rained all the time in Oregon, but that is not so). Kids ran through pumpkin patches and laughed at monstrous odd shapes that would never make it to a supermarket pumpkin bin. They buried themselved in a giant haystack set up for leaping and sliding, talked to farm animals, took the wheel of a vintage tractor and begged to go on pony rides and hay rides. A country store offered local produce, and “Grandma’s Country Kitchen” dispensed cider, caramel apples and popcorn. Harry & David’s huge store in Medford was outfitted for Halloween with stacks of pumpkins outside and pumpkin-shaped candies inside. Mini-pumpkins served as bowls for Fowler’s creamy, spicy-scented squash bisque, and pumpkin seeds floated on top. The next course involved pumpkin too—Anderson Ranch lamb loin in a pumpkin seed crust accompanied by a salad of wild chanterelles, grape tomatoes, endive and shaved Rogue Creamery asiago cheese. The wine that accompanied the soup was a 2005 Claret, a blend of Cabernet Sauvignon, Merlot and Cabernet Franc from Rocky Knoll vineyard on the outskirts of Medford. So choose a mellow red wine to go with the soup for Halloween (or Thanksgiving) dinner. If you can find mini pumpkins. cut off the tops, scoop out the seeds and strings and bake them until partially cooked, then reheat them before pouring in the soup. Clean and toast some of the seeds for decoration. And if you happen to be in Medford next fall, don’t miss the country harvest festival. It takes place on weekends for a month leading up to Halloween. The location is Pheasant Fields Farm, 1865 Camp Baker Road, Phoenix, OR. Tel: (541) 535-3873. To make the squash easier to peel, pierce them all over with a sharp knife, then microwave them one at a time until slightly softened. This will take up to 10 minutes depending upon the size of the squash. If microwaved too long, they will become soft and difficult to peel. Let the squash stand until cool enough to handle, then peel, cut in half, scoop out the seeds and strings and cut them into chunks. Place the squash chunks in a stock pot or large Dutch oven. Add the carrots, celery and onion. Wrap the peppercorns, cinnamon stick, cloves, nutmeg and star anise in a double thickness of cheesecloth to make a sachet and tie securely with string. Or put the spices in a teaball, as I did, cracking the cinnamon stick into smaller pieces so that it fits. Add the chicken stock to the pot and bury the spice bag in the center. Bring to a boil, then boil gently, loosely covered, until the vegetables are very tender, 30 to 35 minutes. Remove the spice container. Blend the soup in batches in a blender. Or puree it in the pot using a hand blender. Stir in the whipping cream, salt and pepper. Serve in prepared mini pumpkins or in heated soup bowls, topped with a spoonful of crème fraiche and a few toasted pumpkin seeds. Makes 3 quarts plus 1 cup, or 12 servings. I'm back--from two weeks in southern Oregon. Friends seemed dismayed when I told them where I was headed. "It's not exotic," they protested, knowing that I am usually off to Asia or to far places in South America. Often, I was the only tourist invading these giant tree communities. The noise that I heard wasn't traffic but thunderous waterfalls and rapids, gurgling brooks and rivers flowing quietly through the woods. Autumn's brilliant colors were beginning to show. Yes, that is I, posing with a plant in red fall attire, the way others might pose with a Hollywood celebrity. Don't ask me what it is, because I am botanically challenged. I didn't have to travel far to watch nature at work. In a city park in Grants Pass, I could watch salmon thrash their way up the Rogue River to spawn. Deer bounded across the road on the outskirts of the city. And a mountain lion was spotted at the property where I was staying. The food was as magnificent as the scenery, from salmon, oysters and sweet, juicy Dungeness crab to freshly picked wild mushrooms, hazelnuts, pears and berries that I haven't seen before. Artisan cheeses and breads, preserves and candies added to the richness. The wines were just as magnificent, because this is a blossoming wine region, alive with a freshness and vigor that seem lacking in polished California tasting rooms. To be honest, listing 10 top tastes is impossible. These are merely things that I enjoyed, from southern Oregon food producers. Restaurants, wine stories and recipes will come later. 1. Rogue River blue cheese: This handmade cheese from Rogue Creamery was named best blue in the world at the World Cheese Awards in London in 2003. And no wonder. Sublimely creamy and subtle rather than aggressive, it spends almost a year wrapped in Syrah grape leaves from area vineyards. Even better, the leaves are macerated in Oregon pear brandy. Rogue River blue is made only in the fall, when the milk is most flavorful. Production is limited, and the cheese is gone in a flash. How nice of the creamery to offer samples for tasting when I was there. And how nice of me not to eat them all. Rogue River blue cheese sells for about $36 a pound, if you can find it. Creamery products are sold at Whole Foods markets, but this cheese is not likely to be there. The best stab at getting a taste is to join the Rogue Artisan Cheese Club. Go to www.rogueriver.com for information. The shop at the creamery sets out samples of cheeses and products such as butter and fresh curds flavored with garlic or pesto. The location is 311 N. Front St. (Highway 99), Central Point, OR 97502. Tel: (866) 396-4704. 2. Umpqua Dairy no-sugar-added turtle ripple ice cream: I tasted this heavenly ice cream on a tour of the Umqua Dairy in Roseburg, where security precautions are so tight that visitors can't bring in purses, cameras, cellphones, watches and dangling jewelry. Therefore, I couldn't photograph the sample that I was handed. I can only tell you that it was outrageously good. Turtle ripple is no-sugar-added butter pecan ice cream combined with a sugar-free caramel swirl and sugar-free chocolate-caramel turtles. It's so creamy that I was amazed to find the butterfat content is only 10 %. The dairy plant hosts tours by special arrangement only, but the ice cream is widely available in market chains from Washington State to Clear Lake, California. Suggested retail is $3.99 for a 1.75-quart tub of turtle ripple and $17 for a 3-gallon tub. 3. Summer Jo's wild Oregon huckleberry jam: The huckleberry is like "an intense blueberry," says Nancy Groth of Summer Jo's, an organic farm, restaurant and bakery on the outskirts of Grants Pass. I came across these little berries in salads, as a garnish, and in desserts. They're harvested wild, and those who pick them say that it is a difficult job. So common in Oregon, huckleberries are nonexistent where I live, so I couldn't go home without a jar of huckleberry jam to spread on homemade bread. Wild Oregon huckleberry jam is $6 for an 8-ounce jar at Summer Jo's, 2315 Upper River Road Loop, Grants Pass, OR 97526. Tel: (541) 476-6882. 4. New Sammy's cowboy bread: I was told that New Sammy's Cowboy Restaurant in Talent (near Ashland) has the best wine list in the region and that reservations have to be made months in advance. But no one said that it has a bakery too. a wholesale bakery that turns out delicious breads. I picked up a loaf of New Sammy's cowboy bread in Grant's Pass. Made from organic wheat flour, purified water, sea salt and natural leavening, it is sturdy and has the chewiest crust imaginable, perfect for sandwiches to pack in a saddlebag and take on a trail ride or tuck in a backpack and tote on a bike ride or hike. New Sammy's Cowboy Bistro is located at 2210 South Pacific Highway, Talent, OR 97540. Tel: (541) 535-2779. The bread is not sold at the restaurant, but at area groceries and growers markets. A 24-ounce loaf was $3.75 at the Farmer's Market, 603 Rogue River Highway, Grants Pass, OR 97527. Tel: (541) 474-0252. 5. Henry Estate Winery's Muller Thurgau juice: You'll ony taste this juice if it's in the tank awaiting fermentation when you tour the winery. The flavor is sweet, rich and warm, with an almost imperceptible tangy edge that reminded me of the Mexican fermented drink tepache. Scott Henry (in the photo above) poured my barrel sample. Founder of this pioneer Umpqua Valley vineyard, Henry is known for devising a trellis system that has been widely copied. The Muller Thurgau grape was created by a Swiss botanist. I haven't tasted Henry Estate's Muller Thurgau wine, only the juice, but that was enough to tell me that the wine must be wonderful too. The 2006 Muller Thurgau sells for $39 at the winery. Henry Estate Winery is located at 687 Hubbard Creed Road, Umpqua, OR 97486. Tel: (1(800) 782-2686. For more information, go to www.henryestate.com. 6. Blind George's Popcorn: There really was a blind George, who started a newsstand where he sold popcorn in Grants Pass in 1922. George and the guide dogs who helped him run the business may be long gone, but the stand lives on and has become such an attraction that you'll hear about it on tour buses. Expanded to include a seating area where customers can relax with snacks and drinks, Blind George's Newsstand is located in the 1895 Hansen Building (no relation) in the Grants Pass G Street Historic District. Locals sit outside, and passersby inevitably drop in for something to read, novelty candies and, of course the famous popcorn. The corn is popped fresh daily in pure butter. Flavors include Cheddar cheese, jalapeno, Cajun, barbecue, strawberry, vanilla, blueberry, watermelon and caramel. The caramel corn--my favorite--is sweet but not cloying. Rather than sticky or crackly with glaze, it is lightly and evenly coated. And it is almost free of hulls and kernels. Bags of various sizes are lined on a shelf to show the prices. My caramel corn was $3 for the smallest size, and I saw popcorn balls for $1.25. Blind George's Newsstand is located at 117 SW G Street, Grants Pass, OR 97526. Tel: (541) 476-3463. 7. Cranberry Sweets cranberry assortment: Walking around the seaside community Bandon, I spotted Cranberry Sweets & More on a corner across from the boardwalk. Inside this large shop are all kinds of tempting candies, produced at a factory in Coos Bay. At least 30 of the more than 200 varieties involve Bandon's leading crop, cranberries. I came away with a souvenir assortment of dark and milk chocolates and a single white chocolate patty with dried cranberries. Typical fillings are jellies, creams, granola and mint, all made with cranberries. Each assortment is slightly different. You can check them out online at www.cranberrysweetandmore.com. But it's more fun to visit the shop where candies are set out for tasting. A 4-ounce cranberry assortment is $5.95 at Cranberry Sweets & More, 1st and Chicago St., Bandon, OR 97411. Tel: (541) 347-9475. The factory in Coos Bay also has a retail shop. The address is 1005 Newark Ave., Coos Bay, OR 97420. Tel: (800) 527-5748. 8. The Chocolate Frog Fudge Factory's Fudge: Too much chocolate candy? Never. There is always room for another superlative example, well not just one, but all of those made by Kathryn Roseberry at the Chocolate Frog Fudge Factory. The two biggest sellers are chocolate walnut and chewy praline vanilla fudge with a layer of caramel and pecans. In November, Roseberry will make pumpkin pecan fudge. Flavors for Christmas are eggnog, hot buttered rum and peppermint candy. And next Cinco de Mayo (May 5). there will be jalapeno fudge. I only tasted plain chocolate fudge, but that was topnotch--mellow, smooth and creamy. The factory, named for Roseberry's penchant for collecting frog figures, is headquartered at her gift shop, Sweetbriar, which is named for the Oregon farm where she grew up. Fudge is $10.95 a pound at Sweetbriar Fine Gifts and Candy, home of the Chocolate Frog Fudge Factory, 29865 N. Ellensburg Ave., Gold Beach, OR 97444. Tel: (541) 247-2231. Phone orders are accepted, or go online to sweetbriar101.com. 9. Cary's of Oregon toffee: Here is one more candy, because it offers an inspiring story as well as great taste. Starting with a family recipe, Cary Cound has developed masterful toffee that gets national attention. An engineer, he was able to upscale a small recipe to make big batches--150,000 pounds estimated for this year-- and devise the equipment to produce it. In the factory, I saw Guittard chocolate cartons, so it's apparent he uses high quality ingredients. My favorite flavors are dark chocolate espresso, dark chocolate hazelnut and mango tea toffee. The toffee comes plain as well as chocolate-coated. Cound has demonstarted that grandma's recipe just might earn a fortune, but it takes a lot of work and entreprenurial drive to make that happen. Cary's of Oregon toffee factory, which includes a retail shop with samples for tasting, is located at 413 Union Ave., Grants Pass, OR 97527. Tel: (888) 822-9300. For more information, go to carysoforegon.com. 10. River Rock Cafe's blueberry-white chocolate scones: I carried one of these on the flight home and portioned it out to last for a couple of breakfasts. Light and fluffy rather than crisp, the scones contain Oregon's famous blueberries and bits of white chocolate that become soft and gooey when warmed. The River Rock Cafe opens at 7:30 a.m. for the scone- and Starbucks coffee-deprived. It's located in a complex that includes a fascinating collection of shops (and I am not a shopper). The complex is also the headquarters of Rogue River Hellgate jetboat excursions. Blueberry-white chocolate scones are $2.95 at River Rock Cafe, open for breakfast and lunch at 966 SW 6th St., Grants Pass, OR 97502. Tel: (541) 476-2628. Tableconversation.com is heading north to go south--southern Oregon, that is. I'll be reporting on wineries, a brandy distillery, food purveyors and farmers as well as checking out places to eat and places to stay. So look for a report on all this in early November, if not before. I'll be back just in time for the Los Angeles-Mumbai Sister City Affiliation Diwali dinner October 26. This celebration of India's festival of lights starts at 6 p.m. at Gaylord on La Cienega Boulevard in Beverly Hills. And for a preview of the flavor, try Aloo Chander, the potato recipe in the post below. It's a dish that I have often taken to LA-Mumbai Sister City board meetings. Make sure you cook potatoes before 2008 ends—not just any baked, boiled or fried potatoes, but something special because the United Nations has named this the International Year of the Potato. 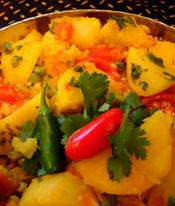 My suggestion is an Indian dish, Aloo Chander. 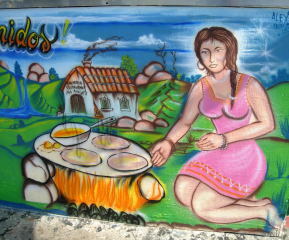 Aloo means potato, and Chander is Phulan Chander of the Samosa House (Bharat Bazaar) in Culver City, California, a longtime friend and fine vegetarian cook. Why an Indian dish? Because India is a leading producer and consumer of potatoes. And people there really know how to treat them. Phulan’s dish is brightly flavored and easy to make. The first step is to grind a masala (spice mixture), using both fresh ingredients and dry spices. The next step is to cook the potatoes with the masala and other seasonings. At the end, you put in tomatoes, peas and cilantro for color. The good news is, if you have to prepare the potatoes in advance, they will be just as good when reheated, maybe even better. A word of advice: your kitchen should be super clean when you cook this. It so happens that 2008 is also the International Year of Sanitation. Combine the onion, chile, lemon juice, cumin and coriander seeds, turmeric and salt in a food processor and process until very finely ground. Stop the processor several times to scrape the mixture down from the sides, then continue processing. Set aside until needed. Makes slightly less than ½ cup. Peel the potatoes. Cut each in half lengthwise, then cut each half crosswise into 5 pieces, making 10 pieces from each potato. Place the potatoes in a bowl of cold water to prevent browning. Heat the oil in a large skillet. Add the onion, garlic, ginger, cumin seeds, turmeric and the masala. Cook until the onion is tender, about 10 minutes. Add the drained potatoes and turn until coated with the spices. Add the water and salt. Cover and simmer over medium low heat 30 minutes, or until the potatoes are tender, stirring once. Add the tomatoes and peas and cook 2 minutes. Stir in the cilantro. Makes 6 to 8 side dish servings. 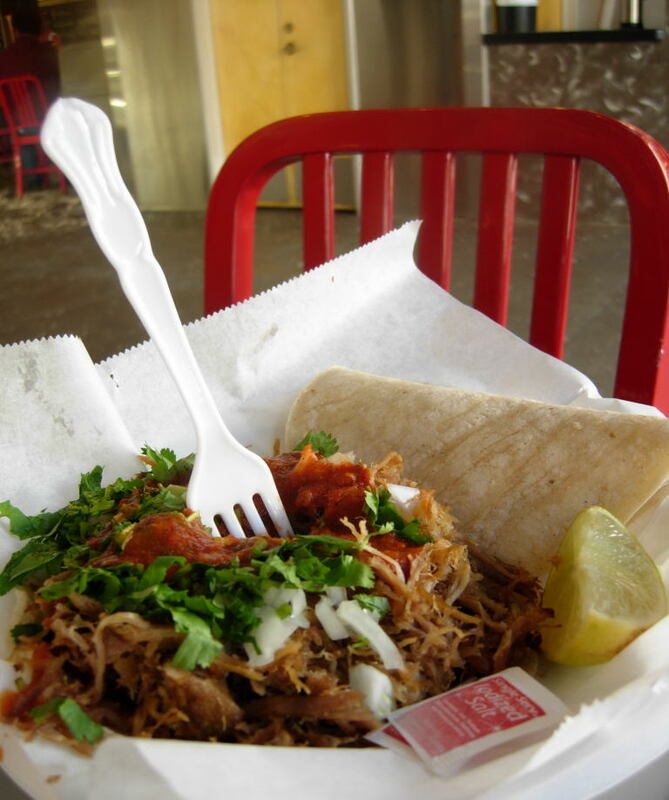 Los Amigos Taqueria can’t boast any designer frills. Until recently, this unassuming restaurant didn’t even have a sign. All you could see from the street was a blank wall. Flyers posted outside listed the day’s specials. They were the only clue that somewhere, someone was cooking. 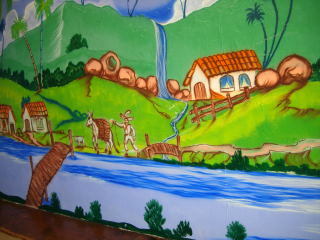 Now Los Amigos has a spectacular sign, a bright mural of the Mexican countryside. 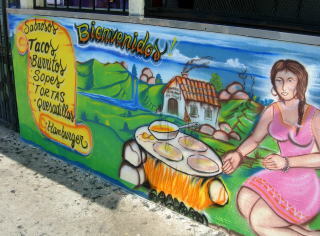 It starts outside with a menu, progresses to a woman cooking on a comal, then disappears inside to cover three walls of the small room where orders are taken. As a vibrant example of Latino folk art, the mural is as much an attraction as the restaurant’s freshly cooked Mexican and Salvadoran food. The artist was Alex Riosola of Los Angeles. Los Amigos is located on West Third Street in a Latino neighborhood just above downtown Los Angeles. A bakery is on the corner, and the Vivian market is next door. Offerings of fres h flowers are placed before a tiled image of the Virgin of Guadalupe set in a wall nearby. The image is illuminated at night. Passing by Los Amigos, it is hard to see anything more than the small front room, which has a counter and a few stools. But beyond is a larger dining area with tables. It is a nice room, cool and clean, with mirrored palm trees, an elephant and mermaid on orange walls. 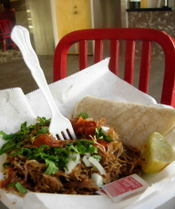 The menu concentrates on antojitos such as tacos, burritos, quesadillas, sopes, tortas and Salvadoran pupusas. The tacos, $1.25 each, are composed of two small corn tortillas topped with a pile of meat, red salsa, onions and cilantro. On the side are radish slic es, spicy pickled carrot, a jalapeno and a lime wedge. 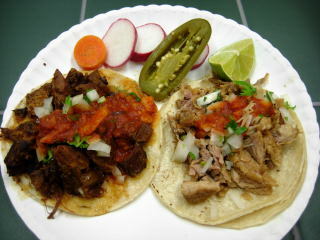 A good combination is a carnitas taco with another topped with savory marinated carne al pastor. 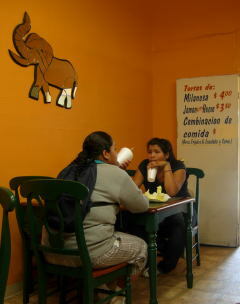 Other fillings are chicken, carne asada, tongue, beef cheeks and buche (hog maw). There are also hearty combination plates for $6. One of these is carne empanizada, a breaded beef cutlet set on a moist blend of white rice and black beans that is called casamiento (marriage). 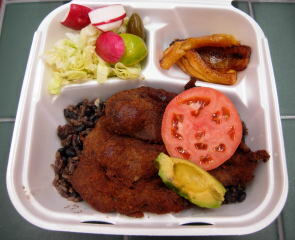 Maduros (fried plantains) and a lettuce salad, tomato slice and avocado come with this. Usually there are chicken enchiladas in a green sauce, buried under a thick layer of chopped lettuce and crumbled cheese and accompanied by rice and boiled beans. Chiles relleno s are sometimes available. Another popular dish is fried bananas with beans and cream. The owner, Aracely Herrera, is from Ecuador, but the food caters to a neighborhood of immigrants from Mexico and Central America and to high school kids, blue collar workers and people like me, who enjoy the atmosphere of this colorful part of the city as well as the food. 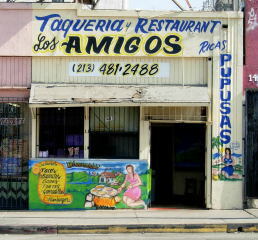 Los Amigos Taqueria and Restaurant, 1445 W. Third Street, Los Angeles, CA 90017. Tel: (213) 481-2488. When it’s 100 degrees outside, you’ll want to drink this wine. And when it’s 70 or 60 degrees, you’ll want to drink it too. This sweet rose, produced in Chile by the large Spanish wine company Miguel Torres, goes well with spicy-sweet Thai food. mellow Indian curries, Chinese sweet and sour pork and other hard-to-match dishes. Or drink it as an aperitif, accompanied by soft, rich cheeses. At 14% alcohol, it's not at all wimpy. 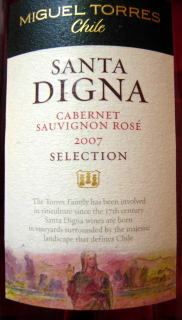 Miguel Torres Santa Digna Cabernet Sauvignon Rose is $8.95 at the wine shop of the San Antonio Winery, 737 Lamar Street, Los Angeles. CA 90031. Tel: (323) 223-1401. 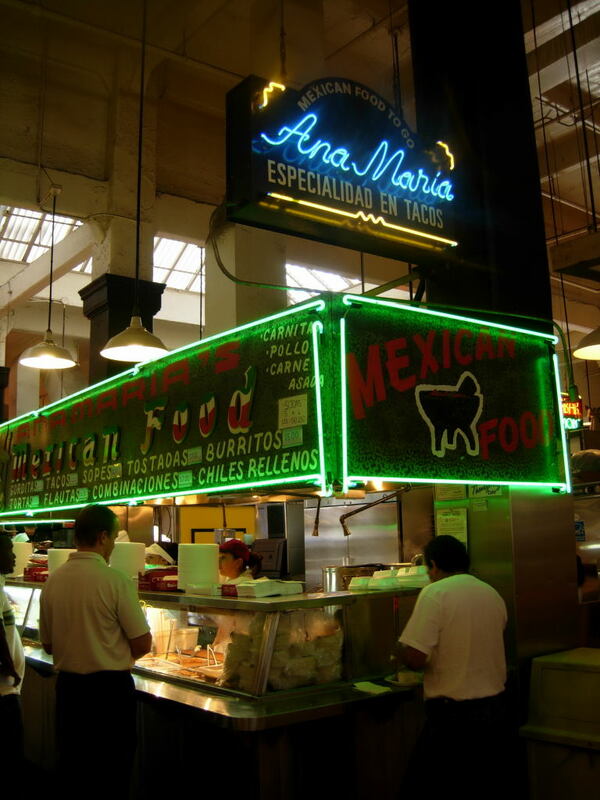 Yet another nasty sign of how the financial crisis is affecting our lives: After years of holding prices steady, A na Maria’s stall in the Grand Central Market in downtown Los Angeles has raised its tacos from $2 to $2.50. There will be no bailout. 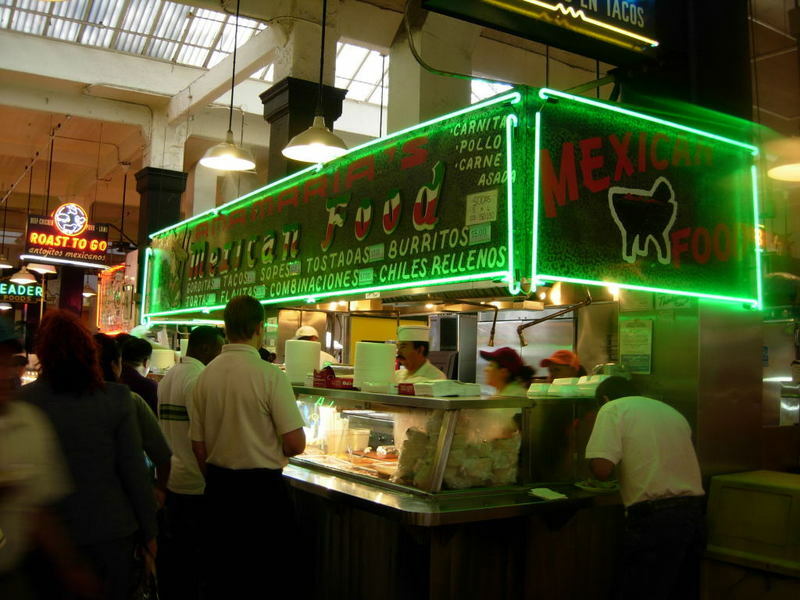 It’s simply pay more, or forget about tacos so tempting that you have to fight through a mob to place an order. Now that I am obliged to splurge, I’ll stick to my two favorite fillings rather than risk something that I might not like as much. 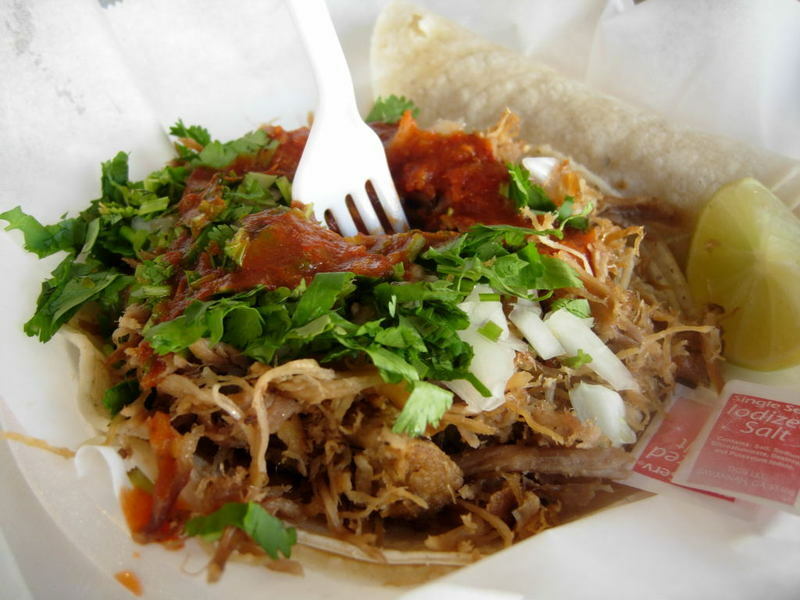 They are carnitas, or por k chopped to shreds before your eyes, and carne al pastor, pork with zesty seasonings, which may be even better. I suppose we’ll still get salsa, onions and cilantro. But in this economy, who knows? Belt tightening may become part of the dress code, not just a figure of speech. All we can hope for is that Ana Maria will carry on, even if we have to tighten our belts another notch and pay $2.75 for a taco. 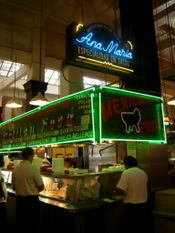 Tacos are $2.50 at Ana Maria, Stall C9-10 in the Grand Central Market, 317 S. Broadway, Los Angeles, CA 90013. Tel: (213) 620-0477. The market is open daily from 9 a.m. to 6 p.m.